KOHLER® marine generators are efficient, compact, and deliver smooth power on demand. They can handle nearly any load requirement. The KOHLER-designed PowerBoost™ and Fast Response™ voltage regulators set the standard for steady, reliable power delivery to all electrical components. Single-side access for routine maintenance checks makes KOHLER marine generators as practical as they are dependable. KOHLER diesel marine generators produce up to 180 kW at 60 Hz, and 150 kW at 50 Hz, while remaining compliant with the latest emissions requirements. Each is also fitted with a sound housing for remarkably quiet operation. Best of all, KOHLER is your true single source partner with every generator, alternator, control, and sound shield designed, manufactured, and assembled — from start to finish — in our own facilities. Small in size, big on performance, KOHLER 4 to 20 kW gasoline generators are perfect for both cruisers and sport boats. 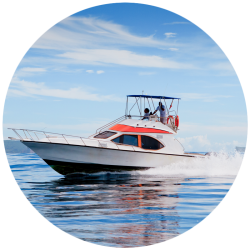 Discover why the world’s leading pleasure craft manufacturers specify KOHLER marine generators. With a time-tested alternator and reliable 4-cycle engines, they deliver peace-of-mind and dependability. KOHLER marine generators have received certifications from the following maritime associations: American Bureau of Shipping, Bureau Vertias, Det Norske Veritas, and Lloyd’s. Making your living on the water is hard work — there’s no such thing as downtime. KOHLER commercial marine generators are engineered to perform in the most rugged and demanding conditions, time after time. Equipped with John Deere (up to 180 kW) and Scania (350 to 500 kW) engines, KOHLER digital controls, and external connection points for easy installation and maintenance, KOHLER generators deliver relentless and reliable power to keep you on the job.